Kuzguncuk is a neighborhood in Istanbul on the Asian side of the Bosphorus at the eastern foot of the 1st Bosphorus bridge. It’s directly across the from Ortakoy on the European side and adjacent to Beylerbeyi, home of the Beylerbeyi Palace. The neighborhood ambles down a leafy valley opening onto the Bosphorus Straight, which separates Istanbul into European and Asian sides. With cobbled streets, Ottoman houses, and small family owned and operated shops lining the lanes, the atmosphere recalls 19th century Istanbul. 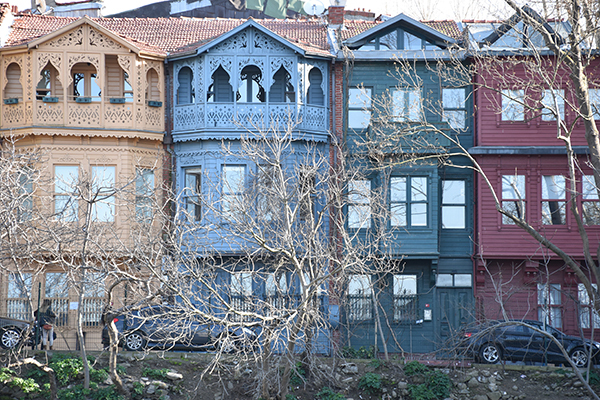 An active neighborhood association works to restore and maintain the traditional character of Kuzguncuk, threatened by more profit-oriented urban development. Historically Kuzguncuk has been peacefully multicultural, with Jews, Christian Armenians and Greeks, and Muslim Turks living and worshipping side by side for centuries. On the Bosphorus shore, a synagogue, church and mosque make friendly neighbors. Jews expelled from the Iberian Peninsula in the 15th century settled here and put down roots, but since the establishment of the State of Israel in the mid-20th century, that population has decreased significantly. Two 19th-century synagogues still stand in the neighborhood and there’s a Jewish cemetery, with graves dating to the 15th century. Istanbul’s oldest Armenian church is here and two Greek Orthodox churches, one of which, Hagios Panteleimon, was first established in the 6th century. Locally, Kuzguncuk is known for fish restaurants, Bosphorus views and the laid-back charm of simpler days. İcadiye Avenue is the neighborhood’s main street, with galleries, every-day shops, cafes and a community garden. Spend a few hours just wandering. Mingle with friendly shop keepers. Linger over a meal, quite likely organic and grown in a nearby garden. Beylerbeyi Palace in the next neighborhood makes a good companion to a Kuzguncuk visit. This entry was posted in Istanbul, Turkey by yalla2013. Bookmark the permalink.